If you have followed me for any time, you are most likely aware that I prefer a white bean-based dip over one that is garbanzo bean-based, like hummus. The texture is smoother and creamier, in my humble opinion, because of the different bean. I also don’t think that tahini is the big deal ingredient that most people think it is. (Sorry Elaine and Yotam.) I love it in some things, not in everything. So if I want a white bean dip or spread, I reach for my favorite – canned Great Northern beans. Then I decide what I’m going to add to it. Hummus eaters make hummus, with tahini and lemon. Same dip, all the time! I like to change things up. Recently I came across a Roasted Carrot Hummus dip from My Kitchen Witch, and it caught my attention because carrots are one ingredient I haven’t added to white bean dip! On this blog there are recipes for white bean dip with fresh rosemary, spices, beets, roasted butternut squash, paprika cream, and pumpkin. This just goes to show what can be done to make spectacular and tasty dips. You don’t always have to make hummus! I’m not using Debi’s recipe, because hers is a hummus. 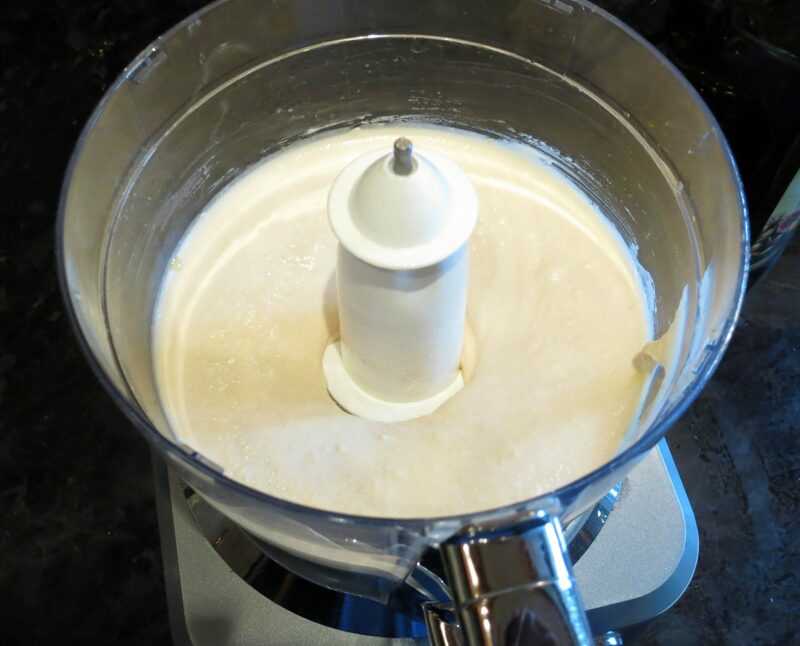 This recipe is a white bean dip. But those roasted carrots got my attention! Thanks, Debi! Scrub the carrots, if necessary, trim the ends, and dry off on a paper towel. Place the carrots, cut into uniform pieces if necessary, in a jelly roll pan, or baking dish. Drizzle with olive oil and season lightly with salt and pepper. Roast until the carrots are caramelized but also tender. Sometimes I turn off the oven after the caramelization shows, to let veggies cook all the way through; you don’t want any burnt bits on tender carrots. Meanwhile, place the drained white beans in a food processor jar. Add the cooled carrots, garlic, cumin, and salt. Pulse as much as you can, then slowly add olive oil until there are no pieces of carrot or garlic any longer, and the dip is creamy. If you like the carrot bits in your dip, process the garlic first, then add the carrots. Serve immediately with pita bread, pita crisps, crackers, or bread. You can see in the photo above how creamy and “pourable” this white bean dip is. And it doesn’t thicken and get mealy like garbanzo bean-based dips do. I sprinkled Aleppo pepper on top of the dip, and for extra color, served it with blue corn chips. Before I could even wash dishes, my husband had finished the dip! That’s his thumb in the photo. verdict: Obviously my somewhat picky husband loved this dip, but I concur that it’s outstanding! The carrots add a subtle sweetness. Note: I’ve never found that Hummus or white bean dips keep in the refrigerator. The garlic gets an off taste from oxidation, I presume, and it never tastes as good as when it’s just made. I recommend only making what you plan on eating on the same day. A while back my friend had a happy hour at her house, and she served a Mediterranean-inspired dip. She’s a funny person, my friend. She claims to hate cooking, but she always serves the best and prettiest food, and even offers signature cocktails. Most of us are familiar with the 7-layer dip; sometimes the number varies. It’s Mexican, or Mexican-American, and typically contains layers of refried beans, guacamole, tomatoes, salsa, sour cream, maybe seasoned ground beef, and so forth. If you love all of those ingredients, then you would love the dip, served with tortilla chips and margaritas. My creative friend, however, was inspired by a recipe she’d seen in a magazine, and created a multi-layered dip using Mediterranean ingredients. It was fabulous. We can’t find the recipe, so I’m creating this version with my own favorite ingredients from that part of the world. Whatever you use, you just can’t go wrong. Begin with having a plate or shallow bowl for serving. Place the white bean dip or hummus on the serving dish. I have had decent store-bought hummus, but I simply made a garlicky white bean dip. Smooth out the white bean dip. Prepare the cucumber by removing the seeds. This can be done with a knife, or simply with a melon baller or small spoon. Cut up the cucumber and place on paper towels to drain. Prepare the tomatoes by de-seeding them as much as possible, then cutting them finely, and placing them on paper towels to drain. Have all of the other ingredients on hand. Begin the layering process by adding the cucumber and then the tomatoes. Add the crumbled goat cheese and drizzle with a little olive oil if desired. Then add the olives, pine nuts and shallots. It was a hot day when I made this dip, so I served a rosé. The fun wth this recipe, is that you can substitute ingredients as you wish. Capers instead of olives, roasted red peppers instead of tomatoes, grilled artichokes, and more. You can top the dip with black pepper, oregano, sumac, za’atar, or a chiffonade of fresh basil. Just stick with Mediterranean ingredients and you’ll love it! Bean dips are so delicious and versatile, and easily enjoyed year round. One of my favorites is White Bean Dip with spices. This one is similar in the use of white beans, but instead of spices, I only use fresh rosemary. 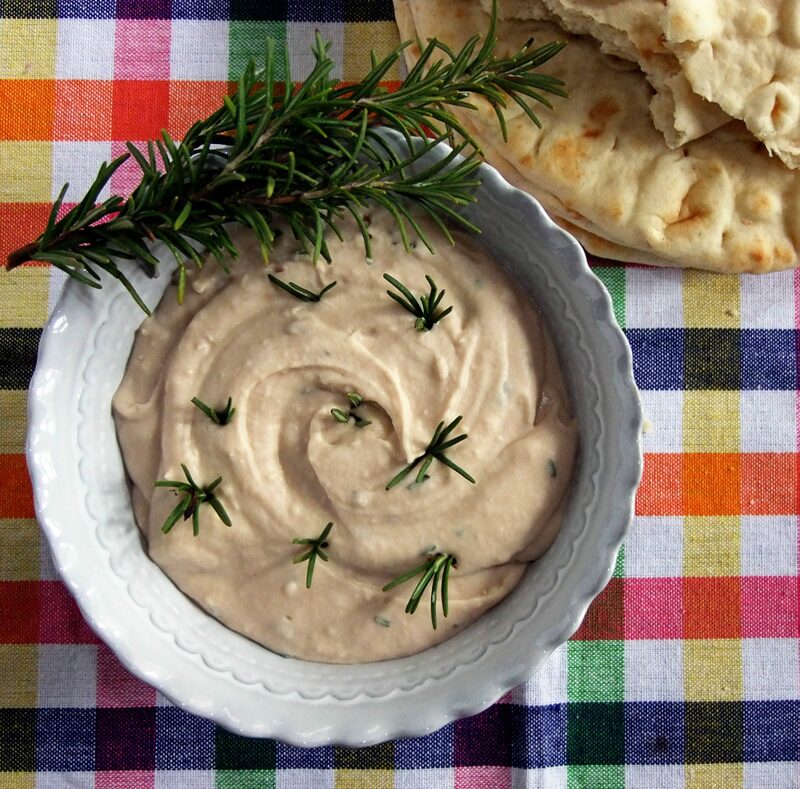 So if you like rosemary, you’ll love this dip. I don’t know if this is as much a dip or a spread, since I typically serve it with a spreader, especially with guests. Whatever you choose to call it, it’s a soft, spreadable purée of rosemary-flavored white beans. It can served in a bowl alongside breads and crackers, as I have, or creatively topped on crostini for a prettier presentation. And let’s not forget the healthful benefits of beans. It’s wonderful to enjoy a delicious appetizer that’s actually good for us! 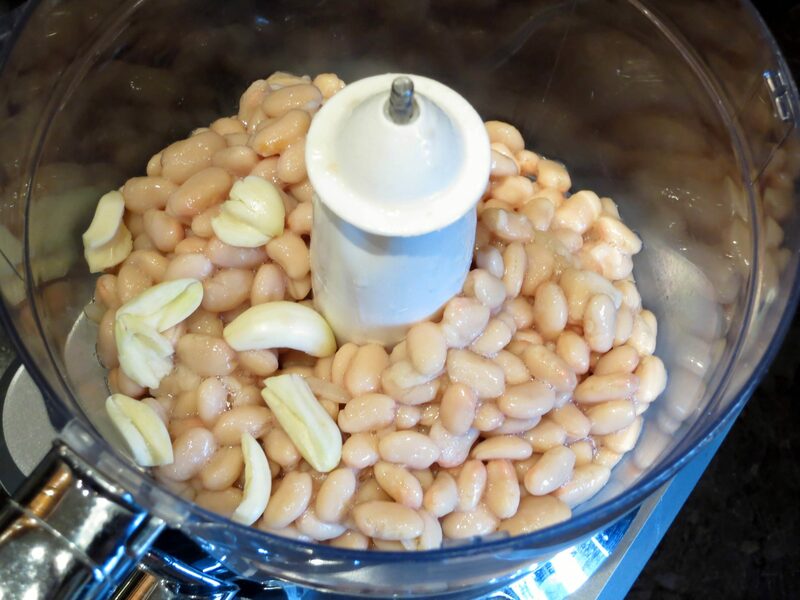 Place the drained beans in the jar of a food processor. Add the olive oil and the garlic, and puree until the mixture is smooth. I always process the garlic first to ensure there are no pieces of garlic left, then proceed with the recipe. I remove the germ from my garlic when I’m using it fresh in a recipe like this, and it’s not going to be cooked, like in a stew. Supposedly the germ is bitter. I’ve not tested this theory, but I do remove it when making this dip. I want a delicious fresh garlic flavor – not a flavor that is bitter and overly pungent. This is especially the case when the garlic is trying to sprout and the germs get quite large. I completely avoid them. Scape down the puréed beans in the jar and process again. 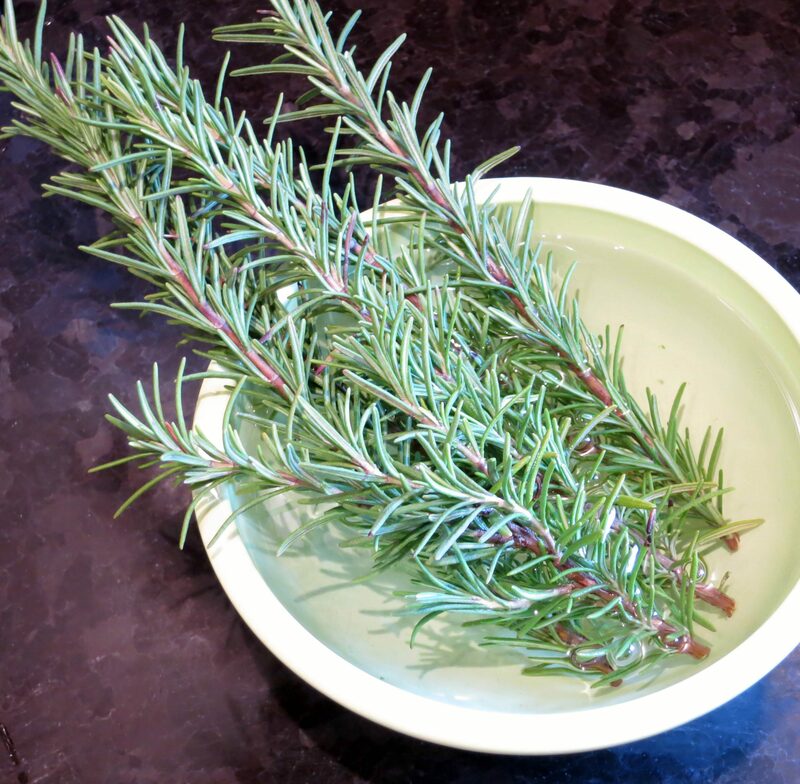 If you’ve picked your rosemary early in the day, simply stick them in water to keep them fresh. I routinely do this even though I’m not sure how much it helps! I figure it can’t hurt. Then add the rosemary leaves and salt to the beans. If you think that the bean purée could be a little softer, add another tablespoon of olive oil. Pulse just to combine, then add the rosemary and salt. If you’re making it about 3-4 hours before serving, definitely make it on the soft side, because the beans will absorb the oil. But I wouldn’t make it any earlier then 3 or 4 hours. Place the dip in a serving bowl and serve at room temperature with assorted breads, and/or crackers. Vegetables are good with it, too. If you make this dip a few hours before serving, keep it at room temperature; don’t refrigerate it. It’s not good refrigerated overnight, either. It just loses the good texture. * My rosemary this time of year is much less pungent than in the summer, so depending when you make this dip, make sure you taste it. Fresh rosemary can be very strong. But whatever you do, don’t use dried rosemary. note: You could certainly use garbanzo beans in this recipe, but I prefer white beans for dips. You can see how soft and smooth they are in the photo after they’ve been pureed with the oil and garlic. In my experience, garbanzo beans never get this smooth, which is why I prefer white beans. I’ve heard that if the garbanzos are peeled, they will become smoother, but I’m not about to bother with that extra step.